Spatial-Temporal (ST) Math is a game-based instructional software for K-5 and secondary-level intervention that is designed to boost mathematics comprehension and proficiency through visual learning. 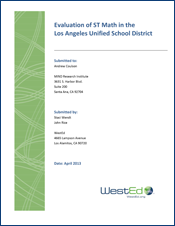 This report, prepared by WestEd’s Staci Wendt and John Rice, presents the results of an independent evaluation of the effects of ST Math implementation in the Los Angeles Unified School District in grades 2 through 5. A discussion of the results and recommendations for next steps are included.